You can’t rely on the talking heads to make your investment decisions. You can’t trust the headlines. Negative news stories have dominated over the last few months. But despite the bad coverage, U.S. stocks had their best January in 30 years. February was stellar as well. And now, stocks are up double digits in 2019. Yet even that big move has a lot of folks worried. They think it’s too much, too fast. But one of my favorite indicators says the recent rally is healthy. And that means more gains are likely from here. I’ve spent the last couple years closely tracking a handful of important indicators. They’ve become my go-to source for the health of the market. That’s because they have a history of flashing early warning signals before the market peaks. And if they begin signaling this time around, we’ll know the end is near. I’m talking about the advance/decline line. We’ve checked in on this indicator many times in DailyWealth. It looks at how many U.S. stocks went up in a day versus how many went down. If more stocks rise than fall in a day, the advance/decline line will rise. This measure is cumulative. So if 100 more stocks rise than fall today, you add 100 to the rolling total. I use this particular indicator to tell when a great bull market is still full of energy, or when it’s starting to wear out… when the crowd is getting tired of the stock market. When the band is approaching its peak, all the seats in the arena are full. The band starts raising ticket prices. But when the band is past its peak, you start to see a lot more empty seats. Here’s the thing: Even when fewer people are coming to the shows, ticket prices don’t come down at first. But eventually, with fewer people participating, ticket prices have to fall. Do you think “PC” culture has gone too far? See this viral message from controversial millionaire Doug Casey… Click here for details. When the bull market is going strong, you see a large number of stocks participating in the rally, so stock prices go higher. But as prices start to peak, you start to see fewer stocks participating in those gains. 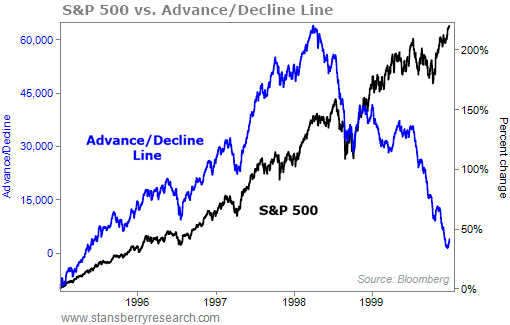 The advance/decline line began to fall in 1998. But the overall market, propelled by just a few big stocks, pushed higher. That was a major warning sign. But it’s NOT happening right now. Stocks have been soaring. They’re up double digits in 2019. And this chart shows the rally is broad, too. It’s not just a few companies pulling the S&P 500 higher… Lots and lots of companies are rallying. This is a hugely positive sign for the strength of the bull market. And it could mean much higher stock prices from here. The facts are that the market is healthier now than it has been in months. The “rock ‘n’ roll tour” isn’t over yet. 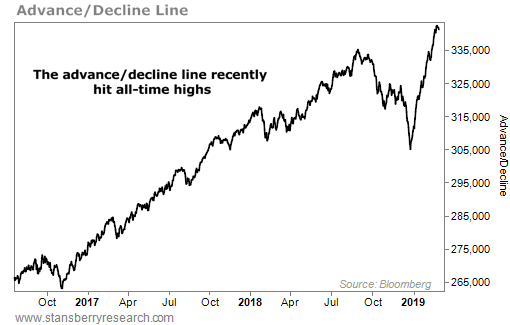 This new all-time high in the advance/decline line shows the recent rally is broad… And that means we want to stay long stocks. P.S. Dr. Sjuggerud says this could be the LAST major bull market we see for the next 20 or 30 years. If you make the right decisions today, you could potentially double … even triple … your retirement savings in the next year… and escape the inevitable crash that will follow. Click here to learn more.